August 2003.GlescaPal Jim O'Neil sent in this class photograph. ".....hopefully my class photograph will be of interest to the 70 to 80 yr old generation who can put some names to the boys I have missed. I understand that many of them have done well in their lives both here and abroad." 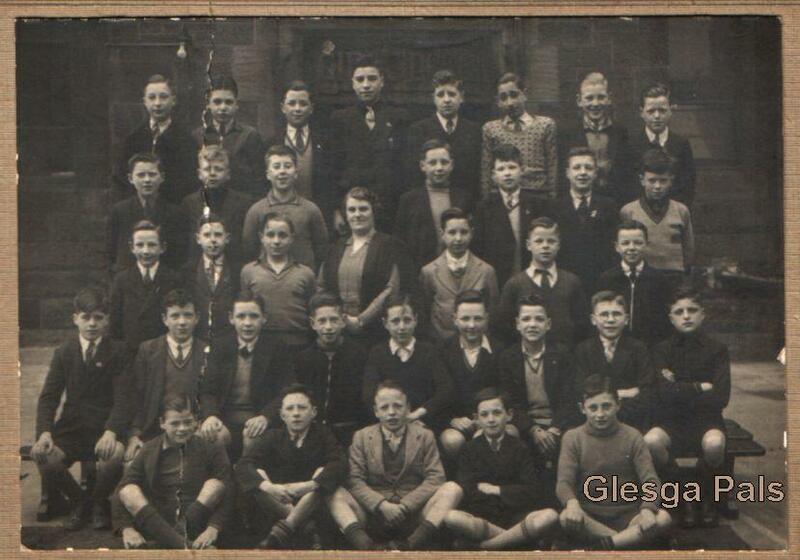 Some of them are featured in the Dalmarnock school class photographs of 1937. The second year term started in mid-August 1939 and with the war breaking out two weeks later all schools closed down because of the dispersal of most families to safer areas away from the city. It took many months before this and other schools got back to normal education and this class never re-assembled. Many of the 12 yr old boys in this class photograph would be aged 19 or 20 and in the forces by the time the war ended in 1945, and I hope, like myself, they returned safe and well. At this moment in time they will be in their late 70's so good on you boys. I am sure that you or your families will let me know how you are doing! " ............Wonderful contribution to GlescaPals website from Jim, for which I am sure we are all grateful. Jim was born 1926 in Bernard Street - attended Barrowfield School before going on to John St Secondary in 1938. He attended everything to do with Queen Mary St. Church and was a founder member of Church House in 1942 along with James Simpson, Archie Buchanan, Robert Hay and John Gibson. After the war and like most others of that time he had to find a house anywhere and finally arrived in East Kilbride. ".....This photograph ia a blast from the past for me. Robert Adams lived in Ruby Street as did Willie Blair. George Storrie lived around the corner in Baltic Street. Willie Blair lives in Chicago, George Storrie lives in Canada and is here in Glasgow, at the present time, for a visit."